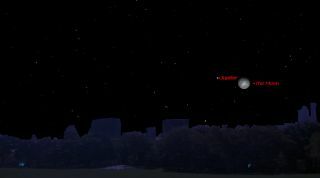 Jupiter and the moon will shine bright together in the eastern night sky on Jan. 7, 2015 as shown in this sky map provided by Starry Night Software. Skywatchers have a chance to spot the bright planet Jupiter and the moon sparkling brightly in the sky tonight, weather permitting, but only if you know when and where to look. Step outside around 8 p.m. your local time tonight (Jan. 7), and look low toward the east-northeast sky. There, you will see a waning gibbous moon, three nights past full phase. Also shining prominently to the moon's left will be what appears to be a dazzling, silvery-white, nontwinkling "star" — but that "star" is actually Jupiter, the largest planet in the solar system. As the evening wears on, both the moon and Jupiter will appear to ascend in the sky, side by side. Jupiter currently blazes at a magnitude of -2.5, meaning that it is more than two-and-a-half times brighter than Sirius, the brightest star in the sky. You can make a comparison between the two as Sirius comes above the southeast horizon at around 6:30 p.m. your local time. To find Sirius, just extend a line from Orion's belt down and to the left, and you'll come to the bright star. Sirius will look quite different from Jupiter since the star appears to sparkle with a bluish-white tint, compared to the sedate whiteness of Jupiter. In about another 10 days, Jupiter will be rising around the end of evening twilight. By the end of January, it will already be gleaming low in the east-northeast sky as twilight fades, second only to Venus in brilliance. Jupiter will climb in the eastern sky all evening, will shine high in the southern sky in the middle of the night and will be low in the western sky at dawn. Jupiter will come to opposition on the evening of Feb. 6, when it will also be at its nearest point to the Earth, at 404 million miles (650 million kilometers) away. The giant planet is a splendid sight in any telescope; its disc is striped with prominent dark belts and light zones that are sometimes (in a good telescope) filled with detail. Of course, you'll also be able to view some or all of the four famous Galilean moons. With steadily held binoculars or a small telescope on this night, you'll find three moons — Io, Europa and Ganymede — on one side of Jupiter, while Callisto will hold a solitary vigil on the other side. But wait until about 10:15 p.m. local time, when Jupiter will have climbed at least one-third of the way up from the horizon to the point directly overhead (the zenith) before you attempt using a telescope. Moreover, Jupiter will be just to the west (right) of the famous "backward question mark" pattern of stars that mark the famous sickle of Leo the Lion, which climbs well up into the sky. Therefore, observers at mid-northern latitudes will be able to see Jupiter cross the meridian at a good high altitude, and well above the atmospheric turbulence experienced at lower altitudes. Editor's note: If you snap a great photo of Jupiter and the moon, or any other night sky view, and would like to share it with Space.com for a story or gallery, send images and comments in to managing editor Tariq Malik at: spacephotos@space.com.